Thom — I am not the one who is abstract. There isn’t a pocket in this photo anywhere. If you’d just think for a minute, Maynard, I’m sure you’d get it. Thom you and I are in Good Company, My Guess was totally Wrong as well. Thom, don’t feel bad… I couldn’t get my brain to work at all!! Wait a minute! Why don’t we want Thom to feel bad? Every week he insults me and nobody cares about that. I insult him back and everybody is worried about little Tommy’s feelings! Sheesh! I think it’s because we worry about taxing his brain? Your brain, Quilly, works just fine! Thank you, Karen! I feel much better now! Mar — you knew recipe but not cookbook! That tickles my funny bone. already 3 here so I am guessing it wont be me that wins, but the dish looks delish!! Caryl — I haven’t read the book yet, but as a meal, it needed salt. That’s a SICK photo for librrarians and novelists to see, you know! I may have to send you my therapy bill after this. Susan, feel free to send the bill. Don’t spend any of the money before you see it, though. Ah, don’t have a therapist anyhow — apart from this bottle of Kahlua. You’re off the hook anyway now that I’m seething with envy for not thinking of “potboiler”. Dang! susan — LOL! That’s how I felt this morning. I wish I’d have thought of that! Sent in a first guess, though not early enough to win (sniff, sniff). I agree with Susan — that photo is a little disconcerting to book lovers! Bill — You’re absolutely correct, your guess is wrong. I am very interested in knowing how you came up with that answer though. You must have been thinking wood stove. My house is just a little more modern than that. My stove is a glass cooktop. Ah, you were actually reading the book! That’ll teach you! Oh, there’s no way I’ll be “win” this one. Too easy and too late! Linda — well this time your wrong was thinking you were wrong! LOL! I’m clueless, despite the clues given in comments above, so I’m sure I’ll kick myself later. However, I’m thoroughly enjoying Susan’s comment above! Karen – -and you’re a cook! I am amazed you didn’t get this right off! I rarely pull out a cookbook, so I suppose that might explain me drawing a blank on this one! 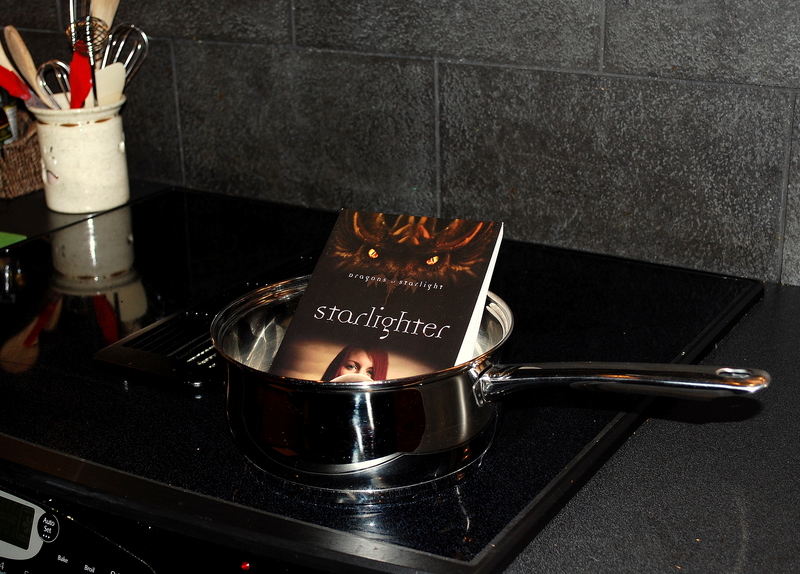 I like to read cookbooks, though I don’t actually use them much for cooking. I made a guess, but I am late. Betty — you’re late but you still made it in the winner’s circle! I’m there but I’m soooooooooooooooooooooo late. I’m late AND baffled. Sigh. We’ve had a 45 degree change in temperature here from chilly to hot and humid. Ugh. I’m sleep deprived and cranky. Hopefully my brain will kick in so I can at least make a guess. I just read the turtle in the car bit. Just to let you know, here in the Houston area we have a very few rattlesnakes. Our part of the great ex-country of Texas is not know for rattle snakes. WE HAVE OIL. Could soon be unwanted oil, our neighbor state has it right now. Jim — one compound word. You should have asked Mrs. Jim for help. I bet she’d have gotten it. And tell my friend Dave there are no rattlesnakes in Houston. One bit him in the ankle when he stepped out his front door to get the paper. Lucky for Dave, it bit him in his left ankle, which just happens to be plastic since he has a prosthesis. Mama Zen — the picture is a clue — well, okay, it’s supposed to be a clue, then. Mar — but your wrong guess was fun. You did? After your guess? Thom — Polona obviously looked at the picture and applied thought, as opposed to just guessing wildly. There are some very clever guesses there! Barbara — yes, but does it strike you as odd that Alastair, the vicar, and Jim, the Sunday School teacher, were the two thinking likes crooks? I wonder why that is? Did I REALLY not comment here this morning??? WOW! I sure thought I did! Welllllllllll…. Congratulations Polona!!! Well done! Melli — you commented on my Seattle photo and left a Punny Monday guess or five. yay, i made it first (and i thought it was too easy to be correct)! Polona — the one I had planned was much harder — so hard in fact that we can’t find the computer file we hid it in! hiding somewhere on the hard disk?